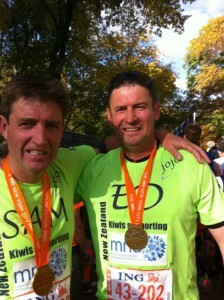 Mark Stewart and FFA were instrumental in helping me to train for; and complete, the New York Marathon in 2013. I’d never run a marathon before but I knew that I had to get fit! I was introduced to Mark by a friend and through kick boxing fitness classes and personal training sessions, Mark helped me prepare physically and mentally. Along the way, I also met a great bunch of people at FFA who all had their own reasons for training (ie. walking National Parks, losing weight, keeping fit for their kids etc). Mark and FFA is much more than just a gym. If you have a dream or just want to stay in shape, I’d definitely recommend coming along. We’re all normal people who have a lot of fun keeping fit under the guidance of a World Champ!